Every May, I sit down and remember all the life lessons my mother taught me to help me become the person I am today. These great things instilled in my mind include values and morals who shaped me into the person I am today. Let’s get on with it! We’ll start with being kind because we can all use a lot of kindness in our day. Always. Even to those people who are not kind back. This is one of the main lessons my parents taught me that I really didn’t like all the time. Because the biggest thing with this is that people will not always be kind back to you. You have to be the bigger person. Always. You need to be able to forgive them and move on. The hardest part is to not let words get you down. Always be the stronger person. Grow from the hurt those words may cause and use them to empower you to be the better person. With all the bullying going on in the world these days, I feel like being kind just tops the list of skills to learn. We need to teach our kids to be kind. It starts at home. At home, we saved money like there was no tomorrow. Growing up, there was not much money for activities I wanted to do or popular items my friends had. I was instructed that my needs are more important to be met first. The truth is, I had everything I needed because we saved. And she instructed me to save money as well. Even in mason jars. But, she also instilled in me that I could have anything I wanted if I worked hard and saved money for it. So, I did. Along the way, I learned skills to make money on the side. An important thing to remember is that it’s so easy to make and save money if you love what you’re doing. That passion shines through to your customers. And if you’re passionate and kind to your customers, the money you desire will just come in on its own. It’s not even about working harder…but smarter. My mom is a very hard worker. Not only does she care for her family, gardens and home, but she helps my dad run their small business in town. She also makes lots of time to volunteer in the rural community. She always makes time to lift a finger to help people…enter kindness again. But one of mom’s weaknesses was always that she could never speak the word “No”. She’s getting better about this, but her big heart has always been responsive to the needs of agendas she is passionate about. She has spend many years of her time tending to the needs of the rural community, church, school and local activities. Sometimes all in one week’s time. This is one skill that I’m tweaking. Don’t get me wrong – I’ll still be working hard. But I’ll be working smarter. What does working smarter mean? I’ll touch on that in a little bit. It’s one of the most awesome things to master when you’re shaping that great life for yourself. You can take on more than you can chew, but you must practice prioritizing the important items on your to-do list. You must find balance. And you have to balance work with play. This one is easy. There was always time for work, but there was also still time for play in our world. Play time is important to prevent burnout. Find something you enjoy doing and make time for it. My family loved to spend time at the lake, to the swimming pool, fishing and enjoying time with friends. We enjoyed the little things and to make the most of the leisure time we had. Being part of a small business and self-sufficient home in a rural community is hard work. Hard work is ok. But leisure play time is just as important. And through it all, time with family and just being together is the most important part. But at the end of the day, it’s all about finding balance to get it all done. One of the cool things to teach yourself about balance is to fit in that time for play. Who doesn’t LOVE to play? But right along with that, you have to remember your responsibilities and prioritize your time to make everything work. But what about those responsibilities. My mom taught me to always be responsible for my own action in life. It’s my fault I didn’t make that sports team. It’s my fault I woke up late and missed breakfast. If something didn’t go my way, it was because of my own actions. No one else’s. And no one else could change the outcome except for me. This is a very valuable thing for me to learn and to have for myself throughout life. And it was HARD! But, in the real world, no one can change the outcome of the path you choose to take. If something wasn’t going well in my life, I had to be the one to change it. And I discovered HOW to change it for the better. Yes, I made plenty of mistakes and wrong choices. But I acquired knowledge from them every single time about what NOT to do. The truth in life is that no one is going to help you along your path. You have to be the one to change. Take that responsibility for your own actions and own that change. Become a better person because of it. So, I’ve just described some life lessons my mother taught me while growing up. This knowledge has shaped me into the person I am today. And I’m well aware that people change. I’ve changed. Through my experiences and blows, I have tweaked and shaped into my own in order to help me find balance. It’s ok to do that. I am not the same person I was 15 years ago. Not even a year ago! My knowledge has expanded. The things I valued then have changed now. And my goals have shifted. ** Check out Mary Powell’s Podcast Interview about Change! I’m striving to always be an approachable and positive person. I want to bring value to other people’s lives, not just mine. Most importantly, I no longer find myself in competition with anyone else except myself. I’ve started businesses off our farmstead that bring in extra cash for my family and I.
Here’s 23 Ideas for Backyard Businesses for you. Check out my Gardening and Small Livestock Consulting Businesses! There might be something there for you. I’m still working hard but I’ve quit working more. Now, it’s about working smarter for me. It’s about getting those big things done first to accomplish more. We make time for play every day. Our life is a playground and we all need to take a step back and enjoy it more. Here’s some ideas for some rural summer fun for you and your family. Oh, Man! Of course, becoming a mother myself has really brought this to life. And realizing I’m responsible for how I’m going to live my life. It’s up to ME to create the perfect life I want to live. And as I can see this perfect life plain as day along the horizon, I’m ready to help others, like you, create that life for yourself. 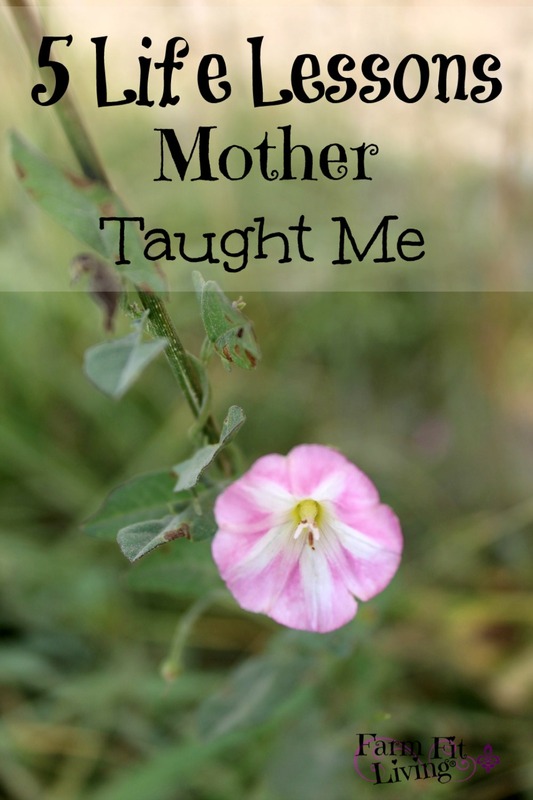 My mom helped me pave this path with those 5 amazing lessons she taught me growing up. It’s up to me to hold them close to my heart and carry them with me along my path to my successful life. All the things my mom taught me while growing up have been instilled in me for the rest of my life. It’s with this knowledge, practice and tweaking that make me the person I am today. They are lessons that have grown me and will continue to shape me. Nevertheless, I can choose to keep or change them. And even though I’m keeping them, I’m tweaking them to utilize them the best way I can. I can choose to be a responsible person who works smarter but still has time for friends and family. I can choose to save for what I want but also to give back and be kind always to others. No matter what. What life lessons did you learn growing up from a special adult in your life? Leave me a comment! I’d love to hear from you.